Now that you’ve seen the high sugar content of many packaged snacks and meals, you’re probably feeling a little anxious. Maybe panicked? So what am I going to eat???? What’s left? Won’t I still have sugar cravings? How can I control my sugar cravings? This post may contain distributor and affiliate links. To find out more about my distributor and affiliate links, read here. I know that whenever I look to reduce sugar (and carbohydrates generally), I go through this every time. It feels like sugar is hidden everywhere and processed carbohydrates are found in huge quantities everywhere. So WHAT DO I EAT??? I’m going to break it down into four major categories of foods that you should be including daily. Today, we’ll talk about your greatest ally in the fight agains sugar cravings – protein. Proteins are made up of smaller building blocks called amino acids, joined together in chains. There are 20 different amino acids. Some proteins are just a few amino acids long, while others are made up of several thousands. Almost every important process in our body requires protein. Enzymes that facilitate chemical reactions in our bodies are proteins. 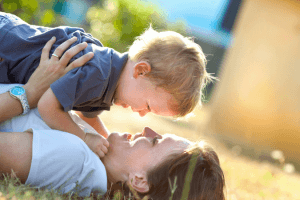 Protein works to transport molecules throughout the body. Hemoglobin is a good example; it is a protein that transports oxygen throughout the body. Proteins make up the antibodies in our immune systems that help to prevent infection and illness. 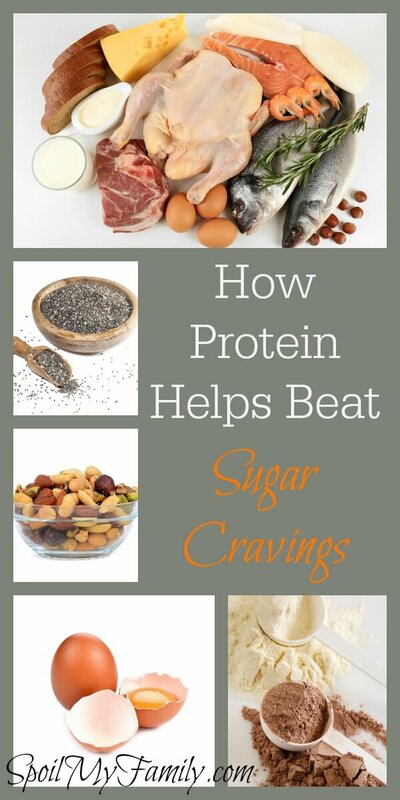 How Does Protein Help Fight Sugar Cravings? Protein is digested much more slowly than carbohydrates and because of this, it keeps you feeling full for longer. And these staves off sugar cravings. If you eat in regular intervals of 3-4 hours, and each meal or snack contains some protein, then you will help keep your blood sugar stable and avoid that irrational feeling you get after you’ve waited too long to eat! How Much Protein Do I Need to Fight Sugar Cravings? The recommendations vary from 10% to 35% of daily calories from protein. This is another one of those things that is specific for your body. I know some people who thrive on lower amounts of protein and some who have to have a hunk of meat every day to keep from feeling run down. You’ll have to pick your own starting point and experiment a little bit from there. 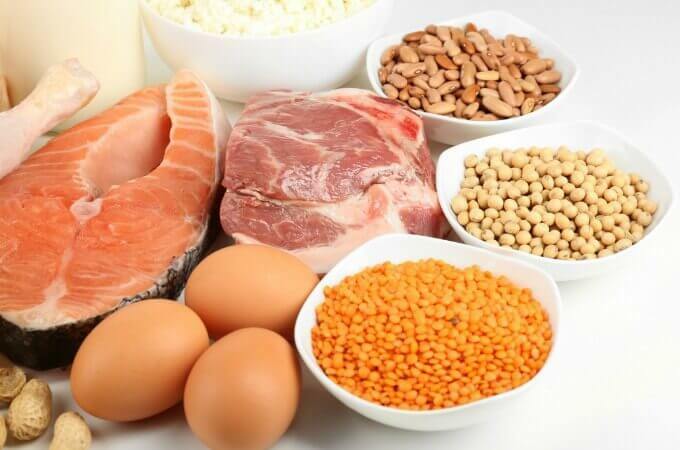 Meats, fish, eggs, and nuts and seeds are the best sources of protein. Also, protein powders can be great to add into a smoothie. What If I’m a Vegetarian? Never fear! There are plenty of sources of protein as a vegetarian to keep sugar cravings at bay. The main concern for vegetarians is that fewer vegetarian sources of protein contain all nine essential amino acids. But that’s ok – you don’t need to get all of the essential amino acids at one sitting. Just try to mix up your sources of protein to get the best array of amino acids to help stave off sugar cravings. Here are some good sources of protein for vegetarians: eggs, dairy, greek yogurt, cottage cheese, green peas, nuts, nut butters, quinoa, beans, chickpeas, edamame, broccoli, hemp seeds, sunflower seeds, chia seeds, buckwheat, and mycoprotein (Quorn). Information, Knowledge, Understanding, Tips, Hacks, Tricks – You’ll get it all over the next 31 days. Kick your sugar addiction to the curb! Think about your favorite sources of protein and several that you might like to experiment with. Consider how you could use them throughout the day with your snacks. Make a snack today that contains protein. Try to eat a meal or a snack every 3-4 hours that includes protein to help keep your blood sugar stable. On 31 Days to Annihilate Sugar I add a daily link to each new post. I really want you to follow along with me on Facebook, Twitter, Pinterest, or Instagram so that you don’t miss anything extra I may be putting out there. But even more – I don’t want you to miss anything – so I want you to sign up for my special emails just for this series! Sign up now and don’t miss out on daily information, inspiration, and scary stuff. Everyone who follows this series and seriously wants to learn about sugar addiction will be entered to win a free copy of Suicide by Sugar!!! Sign up now for a chance to win a free copy of this wonderful book and to make sure that you don’t miss a thing! Sugar is something I definitely struggle with. These tips are great, and I always find that I do crave less sugar when eating more protein. My go-to source has always been hard boiled eggs. They are quick, tasty, and great to make ahead. Hard boiled eggs are a great quick, protein filled snack. Plus, eggs are high in choline which is great! I really really struggle with sugar!!!! Great tips and I need to get more protein in during the day! thanks! 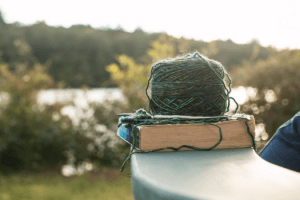 It really can be hard…. But replacing the sugar with things that help you feel full longer and avoid blood sugar spikes makes it easier! You’re right! Protein works! i find nuts and nut butters helpful. Thank you so much for sharing our greatest ally in the fight agains sugar cravings – protein with us at the Healthy Happy Green and Natural Party Blog Hop. I am so delighted that you are partying with us! I’m pinning and sharing.